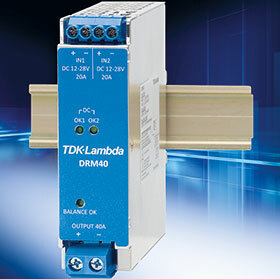 TDK announced the introduction of the DRM40 series of DIN-rail mounted redundancy modules. Two 10 V to 30 V d.c. inputs are rated at 20 A each and the output at 40 A. A 150% peak load capability for four seconds is provided for capacitive and inductive loading. The internal MOSFET reverse current protection devices have a low 200 mV drop, reducing voltage losses in the module. An LED on the front panel provides a visual indication when both input currents are balanced and equally sharing the output load. Applications for the DRM40 modules include factory automation, process control, and test and measurement equipment where two power supplies are used in a redundant configuration, paralleled to obtain higher power or for battery charging purposes. In addition to two front mounted LEDs, the DRM40 has two isolated ‘DC good’ PhotoMOS relays to remotely monitor the presence and status of each input voltage. For cost-sensitive applications, the DRM40B model provides the same reverse protection functionality, without the ‘DC good’ and current balancing circuitry. The DRM40 series is housed in a metal enclosure, measuring 124 mm in height, 125 mm deep and a width of 35 mm. The modules are rated for full-load operation in -40°C to +70°C ambient temperatures.